Weddinghousehold.com - The number of ceremonies surrounding Muslim weddings makes them special and there remains a lot of flexibility for the bride and options when it comes to choosing outfits. The variance in types of outfits for a Muslim bride may change according to the family tradition and the region to which she belongs. Moreover, changes can be interpreted in cross-culture weddings that leave scope for more options whether it is the day of the wedding and the occasions in the post-wedding period. 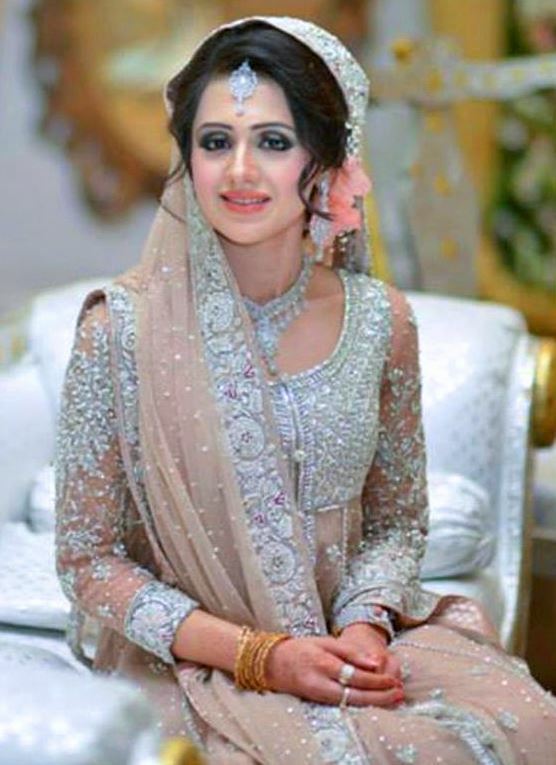 Surprising though it may seem that some of the Muslim brides prefer to get married in white clothes with embroidery while other may prefer to choose bright-colored clothes with zari work, the difference is primarily based on regions. 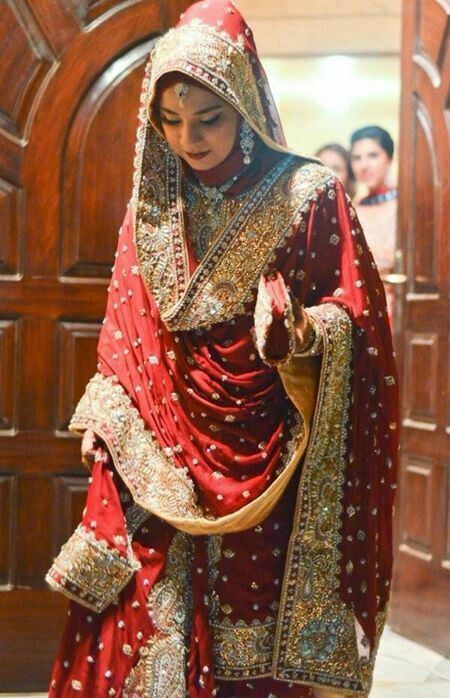 In countries that are more religious, the Muslim brides prefer wearing the Indo-Muslim clothes which consist of the traditional sharara or hijab with lots of embroidery. 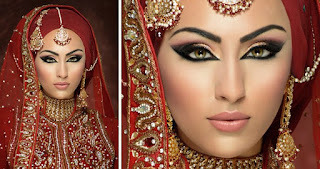 However, the dressing options may change when a Muslim bride has been brought up in a foreign land and the western influences are likely to show up in the outfits as well. 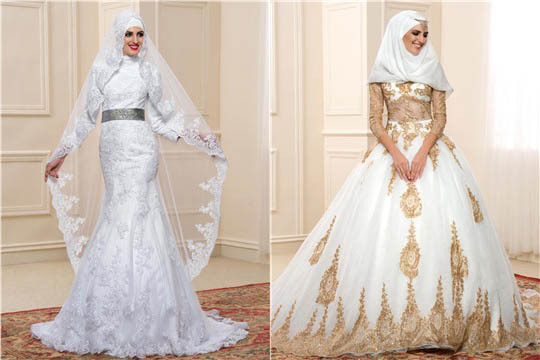 Have a look at the points below for exploring types of outfits for a Muslim bride. This is a popular dressing choice of a majority of Muslim brides as a sari symbolizes elegance on the one hand and modesty on the other. A sari with sequins, embroidery and different kinds of stiches is the laid-back style for a Muslim bride. The salwar kameez is a popular and traditional dress of the Muslims and a lot of experiment in gold and silver zari work is carried out by the designers during the present times. Along with this, the dupatta which is preferably put on the head can be designed with enriching embroidery and bright colors along with light shades on the entire outfit. Muslim women coming from families that are liberal may choose to wear a complete white dress on the wedding day. Thus, loose-flowing dresses or tight mermaid dresses can make the day for a Muslim bride for adding a zing of versatility to her attire. A lot of changes have taken place in the styles of hijabs that are flaunted by Muslim brides. For instance, hijabs with diamonds, pearls and sequins can make all the difference whether it has been designed for the wedding day or afterwards. Along with bright shades of kundan jewelry, it can be the most alluring attire for a newly-wed bride. For Muslim brides that prefer to follow the lines of flexibility, it is good to take a look at the frills and plain cut outfits be it a sharara or a hijab. However, women must also look into the comfort factor before deciding the outfit for the wedding day or the dresses that she might just choose to wear after wedding keeping in mind the traditional aspects of the family. Following the above tips can help a Muslim bride to choose the right wedding outfits that she can explore for the wedding day or the occasions that she has to attend after the wedding. 0 Response to "Types of outfits for a Muslim bride"